In India this is how we make omelet, minus bell peppers and broccoli. Also, we make it on stove-top instead of the oven. When Not on a diet, we serve it sandwiched between 2 delicious slices of white bread toasted with butter on stove-top and we call this awesomeness “bread-omelet”. Its a very popular street food across India. You can make these in a muffin tray for easy sharing. I cut the pie into 4 slices, ate one for my breakfast and froze the rest for later. I wrapped each slice individually in parchment paper and put them all in a ziplock bag. Voila, breakfast for 3 more days. I would just take thaw them the night before in refrigerator and throw them in toaster oven in the morning to warm up. Microwaving will make them soggy. Heat ghee in a wrought iron skillet or any oven proof skillet. Throw in shallots, ginger and garlic and saute for a minute until shallots are starting to caramelize. Add rest of the vegetables except green onion and sprinkle a tbsp of water all over. keep covered for veggies to steam cook. about 1 minute. While veggies are steaming, break eggs into a bowl and sprinkle salt, pepper, turmeric and paprika. Uncover the skillet and stir veggies to make sure water has been completely absorbed and no more moisture is left at the bottom of the pan. Now evenly pour egg over the veggies. Place the skillet in preheated oven and bake for 10-15 minutes. 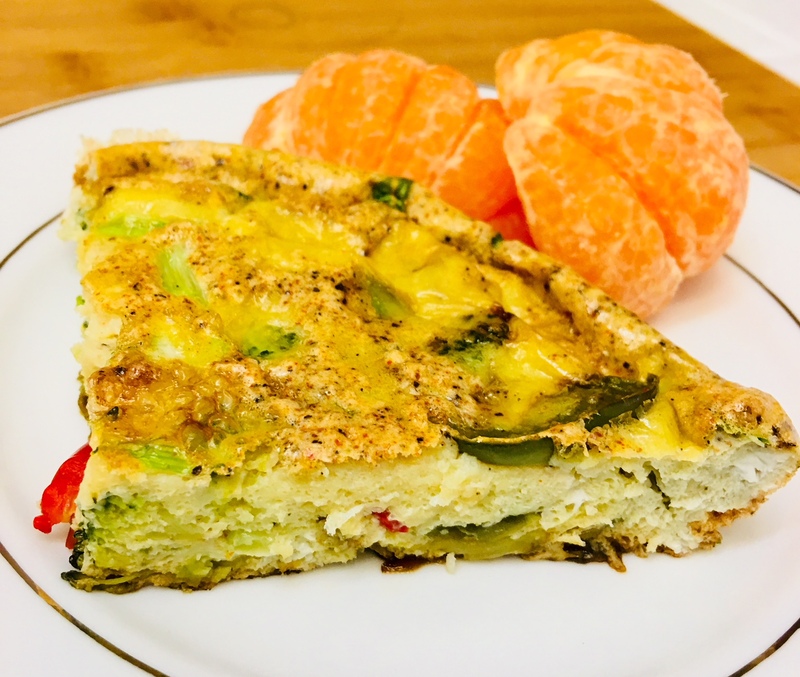 Remove from oven, wait for 5 minutes before slicing up and devouring this wonderful frittata.